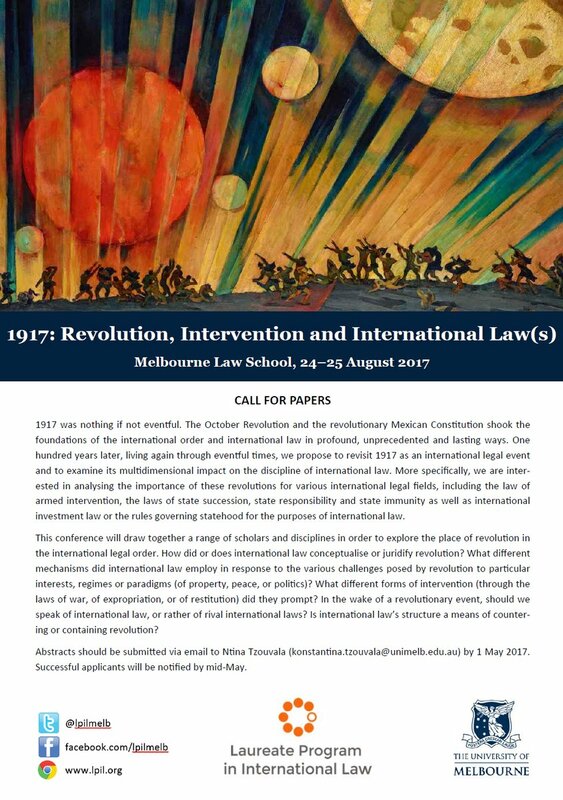 This conference will draw together a range of scholars and disciplines in order to explore the place of revolution in the international legal order. How did or does international law conceptualise or juridify revolution? What different mechanisms did international law employ in response to the various challenges posed by revolution to particular interests, regimes or paradigms (of property, peace, or politics)? What different forms of intervention (through the laws of war, of expropriation, or of restitution) did they prompt? In the wake of a revolutionary event, should we speak of international law, or rather of rival international laws? Is international law’s structure a means of countering or containing revolution? Email abstract submission to konstantina.tzouvala@unimelb.edu.au by 1 May 2017. Successful applicants will be notified by mid-May 2017.